DWTS Season 12 – Most Watched Season EVER??? So, this is one of those posts that I threatened to do during one of our Cheesecake Awards posts and it came up because of the Tom Bergeron claim that Season 12 was the “most watched season EVER! !” I was certain that he and the producers were taking liberties with the data and the numbers. Was I right?? Well, it depends on how you look at it. 🙂 Keep in mind, also, that the numbers only go back as far as season 5. If you only count the performance shows and average each episode’s ratings into one number for a season average, then yes, you can say that season 12 was the most watched – but that’s kinda stupid, because the results shows count too. Season 12 was NOT the most watched when you do the same math for the results show – Season 5 was. So, you might say, maybe they are talking total viewers; that is, all shows viewers added together for a total number for each season. Well, no – Season 5 still wins UNLESS you cheat and add in repeats and filler shows. Highly disingenuous to do that and count those numbers. I would guess that’s what they did. What did TV Guide mean, though, when they said that DWTS was up by “double digits?” I have no idea. 🙂 If you compare Season 12 to Season 10, it’s up by more than 5% overall, so I’m not sure what they were referring to. Five percent sounds like a lot, but really it’s almost entirely results show ratings that went up and I’m sad to say that I just didn’t have it in me to analyze why the results show suddenly started doing better – my guess is that it’s combination of lots of factors. 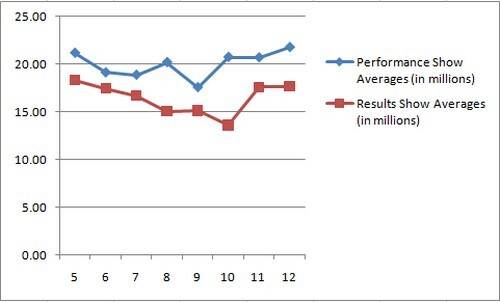 I found it pretty interesting how well the performance show and results show mirror each other. But, more than that, the majority of them hover around the 20 million viewers mark. The exceptions are interesting – seasons 5, 11 and 12. What’s going on there? Well, let’s look at the final three. Season 5 was Marie Osmond, Helio Castroneves and Mel B, correct?? Season 11 – Jennifer, Kyle and Bristol. Season 12 – Kirstie, Hines and Chelsea. Season 11 and 12 I am tempted to credit to Jennifer and Kirstie with a dash of Hines and Bristol thrown in. Why? Well, I think Jennifer and Kirstie are arguably the two bigger stars of just the right age to appeal to DWTS main demo. Hines because he may have brought a new demographic and Bristol because she was so controvertial. But why no Donny Osmond? His season is actually the one with the lowest average rating (how DO we break it to him? 🙂 ). So, I dunno, I think it’s more complex than who’s on the show. For example, go back to the first graph of season averages. 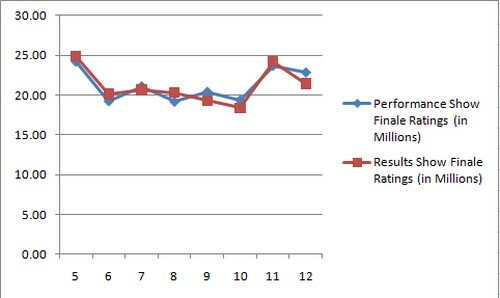 See how the results shows are trending downward, reaching a low point during season 10?? Why? The easy answer is – well everyone knew Nicole was going to win. But I don’t think it was that simple. The performance shows were the highest they’d been since Season 5. Guess what else was on TV during this time? The Olympics. And isn’t Season 11 the one where American Idol moved it’s performance show to Wednesday night (for the most part)?? That could also explain the DWTS rebound in results shows for Seasons 11 and 12. The moral of the story is, the more I thought about this, the more I realized that it’s much too complicated to figure out WHY the ratings have trended the way they have. Just be happy that it’s still the number 2 (and sometimes number 1) show in the country. AND, rather than declining in viewership, it’s on the upswing. Largely, I think we can say thank you to American Idol to adjusting it’s schedule, and I think we have to admit that the longer the show stays on the air, the easier time they have in putting together a cast that draws viewers in. I think they also get some credit for maintaining a good stable of professional dancers – but none of these factors alone is big enough to point at and say “Oh, they screwed up there.” Where they have to be careful is that they don’t go too far in messing with success. They have too much tendency to listen to the noise and that will, IMO, get them in trouble. By noise I mean those of us here on the net and people in the media complaining about Bristol or the controversy of the day – don’t try to fix the squeaky wheel. The squeakers, if they are as big a group as 100k (and I think I’m being generous) are a TINY fraction of your audience. But at some point, the tinkering runs the risk of turning off the majority – then they’ll be in trouble. Sources: Seasons 11 and 12 – PureDWTS media posts; All other seasons Zap2It.com. I did compare Zap2It’s seasons 11 and 12 ratings to our ratings to ensure there wasn’t a bias introduced by a given source and the numbers match up very closely. DWTS Season 13 – Anyone Want to Rant?? Why on earth would anyone take the time or energy needed to chat with them about who they want on the show? Last season, didn’t they try to get people to campaign for their favorites? And how many of those people did they actually pick and put on the show? Answer: NONE. Well, now, the kids who cried wolf are clogging up my twitter searches with people actually believing they have a shot of getting their favorite on the show. Again. Hmmm….maybe that is their evil plan. In any case, at some point your audience (those who are actually crazy enough to believe they would have a shot at getting their favorite on the show) is going to realize that you don’t really give a crap about what they say and are going to tune you out. Sure, there are those who know better and are just playing the game with them – but there are way too many who think because this is DWTS’s twitter account that they actually might have a shot. :::sigh::: People, the real deal here is to get DWTS trending, to liven up their followers and to build buzz (and more false “rumors”) for season 13. Period. End of Story. Don’t waste your time with serious campaigning – it doesn’t WORK. DWTS: Midseason 2010-11 TV Ratings – Dancing With The Stars 9th! The Midseason TV Show Ratings have been announced! According to EW, Dancing With The Stars rates at #9!! Below is the Top 30! Be sure to view the link to see which other TV shows made the Top 50 (and bottom 50). Special Note (as Heidi just wrote me): DWTS hasn’t aired since November and that affects it’s standings in the midseason ratings and why it might not be rated even higher. All of the other shows listed have aired since November, so they benefit by the lack of DWTS. American Idol didn’t air at the same time as Dancing With The Stars, but, it probably has artificially high numbers due to the curiosity factor. So, do you see any of your favorite shows? Any surprises or disappointments? I was glad to see Hawaii Five-O make the Top 30. I was also glad to see Glee in the Top 10. I love that show (next to Dancing With The Stars” of course 😉 )! House is one of my favorite shows as well.